Acronema a short, thin terminal extension at the end of a flagellum. Image from Guillou et al. (1999). Actin the most abundant single protein in most eukaryotic cells. Microfilaments are essentially actin polymers. Actin may exist as a globular monomer (G-actin) or as a linear polymer F-actin). See links at Microfilament Links. Alveoli An important synapomorphy of the Alveolata. The alveoli normally appear as small vesicles in or under the plasma membrane. They are not associated with ribosomes and do not have any detectable contents. They do not seem to be connected with any membrane system other than the plasma membrane. It is now believed that the alveoli are part of a complete second inner membrane system. Amino acid the fundamental building block of proteins. There are twenty different amino acids normally found in proteins. All have the general structure shown in the figure. In proteins, the amino acids are joined by peptide bonds as shown in the image. Notice that the central carbon atom has four different ligands. It is therefore asymmetrical and can exist in two mirror image forms (enantiomers), known as L and D enantiomers. Proteins in living organisms are all made from L-amino acids. However bacterial cell walls and a few other structures incorporate some D-amino acids. A few naturally occurring amino acids are not normally found in proteins and are not specified in the genetic code. Ornithine (R = (CH2)3NH2) is one example. These non-protein amino acids are common intermediates in a variety of metabolic pathways. Finally, some amino acids may be chemically modified after they have been incorporated into proteins. Antenna pigment a light-absorbing pigment which is used to transmit light energy by absorbing at one wavelength and emitting at another. In the usual case, light is initially absorbed by a pigment which is sensitive to a range of wavelengths outside the range which chlorophyll can absorb. Antenna pigments act as transformers to modulate the wavelength so that the light energy can be passed to chlorophyll and used in photosynthesis. Apical complex the characteristic organ complex of the Apicomplexa, including rhoptries, micronemes, polar rings, and, if present, the conoid. Autogamy "fertilization" between two daughter gametes of the same gametocyte. Typically this occurs without complete separation. That is, the nucleus of the diploid or tetraploid gametocyte divides without DNA synthesis and without complete cytokinesis complete separation of daughter cells). The resulting cell then behaves like a zygote resulting from fertilization. 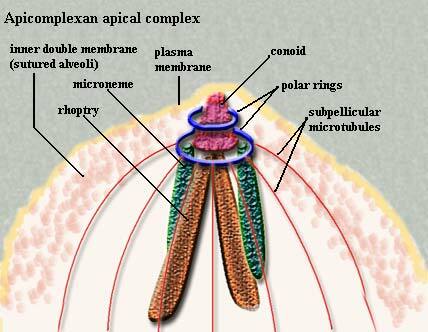 Axoneme the fundamental 9+2 doublet microtubule structure at the core of the eukaryotic flagellum. The axoneme arises from the basal body and inserts into the axosome. Axopod Thin processes (a few microns in diameter but up to 500μ long), supported by complex arrays of microtubules, that radiate from the bodies of radiolarians and various other cells. Each axopod is composed of a core of microtubules, the axial rod, which arises in the medulla, and a thin covering of cytoplasm enclosed in the cell membrane. An axopod which comes in contact with a food item quickly retracts, and the item is phagocytosed. Axosome the thin extension of the plasma membrane and associated cytoplasm that covers the flagellum. The microtubule doublets originating in the basal body insert into the axosome. See image at flagellum. Axostyle The microtubule-containing organelle known as the axostyle found in certain zooflagellates propagates undulatory bending waves similar to a flagellum or cilium. Electron microscopy studies show that the motile axostyle in the wood roach commensal oxymonad Saccinobaculus and the termite protozoan Pyrsonympha contains several thousand singlet microtubules interconnected by cross- bridges. The microtubules are organized into rows, and the microtubules within the rows are connected to each other by regularly occurring linkers or intra-row bridges. In turn, the rows of microtubules are interconnected by less regularly occurring cross-bridges or inter-row bridges. The intra-row bridges appear periodic along the tubules with a spacing of 16 nm. The inter-row bridges are not strictly periodic and can be oriented at varying angles to the axis of the microtubule. Langford & Inoue (1979). This reference also contains several good electron micrograph images illustrating the ultrastructure described above. The oxymonad Saccinobaculus has an especially impressive axostyle, with many images on the web. Blepharoplast same as basal body.